I am participating in a blog challenge this month. 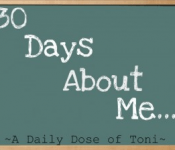 It is 30 Days About Me from the blog a Daily Dose of Toni. Today’s topic is something that I would rather forget. As I think about it this is something that I never want to forget. It is 9/11/01. Last year I recorded my radio show Dog Works Radio (then known as The Dog Doctor Radio Show) as a remembrance to those who lost their lives in this horrible act of terrorism. Please take a few minutes to listen to this show. It may be difficult at times but it makes us who we are as Americans. What a wonderful post!!! I will never forget any moment of that day either and definitely don’t want to.